The Eno River flows into an area dominated by the sedimentary rocks of the Durham Triassic basin east of Roxboro Road (pl. 1 ). At this point the Eno River enters the Triassic lowland. Sedimentary rocks form from the erosion, transportation and re-deposition of older rock types. Igneous, metamorphic and sedimentary rocks can be eroded and broken down into pieces to become components in a sedimentary rock. Conglomerate, sandstone, siltstone and mudstone are sedimentary rock types found within the Durham Triassic basin along the Eno River. As the names imply, sandstone is composed of sand-size sediment, siltstone is composed of silt-size sediment and mudstone is composed of mixture of silt- and clay-size sediment. Conglomerate is a sedimentary rock that is composed of rounded to partially-rounded boulder-, cobble-, gravel- and sand-size sediment. To view photographs of several examples of sedimentary rock types found within the Triassic basin - click here and here. These rocks are commonly red, maroon or brown in color and form soils of similar color. The red, often clay-rich, soil exposed in construction sites in the Durham area is typical of the Triassic sedimentary rocks. These sedimentary rocks are less resistant to erosion and rarely form outcrops compared to the crystalline rocks of the Carolina terrane. 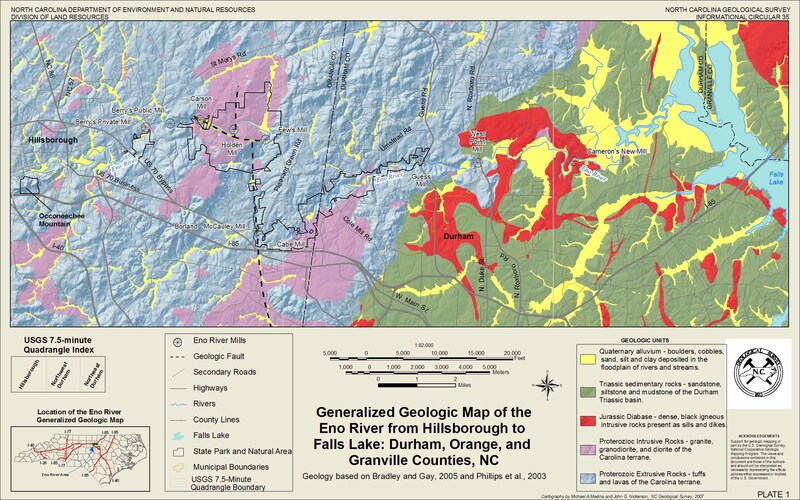 The majority of the city of Durham is relatively flat in comparison to the Hillsborough and Chapel Hill areas because the underlying sedimentary rocks are easier to erode. Slightly-metamorphosed sedimentary rocks are interlayered with the volcanic metatuffs and metalavas of the Carolina terrane in the Piedmont upland portions of the Eno River area. These sedimentary rocks, called epiclastic rocks, are different from the sedimentary rocks in the Durham Triassic basin. The epiclastic rocks are composed of fragments of eroded volcanic and plutonic rocks and are the same age as the volcanic rocks interlayered with them. The presence of epiclastic rocks interlayered with volcanic rocks indicates that while the volcanic rocks were being deposited, erosion of those volcanic rocks was also taking place.